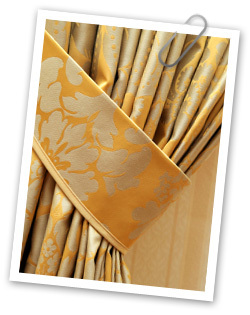 Curtains, drapes, and linens need to be stored very carefully. There are different precautions to take depending on the size and type of material. The best way to store your linens is in an acid-free box with acid-free tissue paper, as the acid in cardboard can cause the material to yellow. Be sure to use a large box to prevent wrinkles and folding. Line the box with tissue, polyester wadding, or white cotton sheets. If using tissue, be sure it is acid-free. White tissue is recommended, as other colors can bleed onto fabric. Completely wrap the entire linen in the tissue, sheet, or wadding so none of it is exposed. If you must fold the linen, be sure to put the acid-free tissue or sheet between each layer. Then add the lid and seal it completely. Be sure to put some slits in the box to allow air to circulate. Avoid plastic bags or cellophane "windows," as they prevent air movement. They can also cause moisture to form inside and mildew to grow. Once packaged, linens should be stored on rust-free metal shelves or in drawers. If you wish to store them in wooden drawers or on wooden shelves, you must first seal the wood with a water-borne polyurethane varnish and place some acid-free tissue between the wood and your box. That ensures that acids won't transfer from the wood to your linen. Do not use starch or iron before storing them, as it can cause staining or yellowing. It can also attract moths. It is better to iron and starch just before you plan to use the linen. If you are storing your drapes for later use, they should be stored hanging up, to reduce wrinkles that sometimes occur when storing lighter-weight textiles in boxes. Avoid metal and flimsy wooden hangers; instead opt for padded hangers in order to support the item. If you can, hang the drapes or curtains a few days before you need to store them to let any wrinkles air out. You can also mist the back of the drapes or curtains a few days before storage to help remove wrinkles, but don't get the fabric too wet. You also don't want to mist the front of the drapes or curtains. Place a muslin dust cover over the item after hanging it. Avoid storing in plastic or vinyl bags, as they can deteriorate over time. It is recommended to wash the muslin cover and other cotton storage supplies that might be on the hanger annually. Be sure all items are as clean as possible before storing them. Check that there are no stains or wrinkles; it would be very difficult to remove them when taking them out of storage. Store your items in a dark place, away from heat and moisture, where temperatures are stable. For delicate, valuable or antique linens, consider indoor self storage or a climate controlled storage unit. Do not fold the item any more than necessary. Be sure to check the condition of stored linens annually. Look for mildew. Take the opportunity to refold or replace tissue if necessary. If you use non-acid-free tissue, you must replace it yearly. If your items are made from cotton, linen, or rayon, you must rewash them every year or two to avoid acid build-up and deterioration. Label and date what you are storing, especially if you are storing many items in identical containers. If you take the proper precautions before storing linens, drapes, and curtains, they can be used for years to come.